Before last year’s draft, Carlos Gomez was a solid, under-handed, first-round pick… and then he spent all year battling injuries. This year, we’re giving him another shot at greatness, mainly because he should be well-rested after taking much of last year off. Actually, another reason is that he’s on the Astros, now – an actual contender with a stacked lineup all around him. There are going to be guys all over the basepaths in Houston for Gomez to drive in, then there will be a bunch of power-hitting goons behind him to drive him in. Carlos Gomez has a real shot to excel this year as there’s a lot less pressure on him to carry the whole team on his back. We saw that he tried to do too much when he first showed up in Houston in 2015 and he made some bone-headed mistakes. While battling injuries all season, Gomez hit just .255 overall (and he actually hit worse than that with the Astros) with 12 HR and 56 RBI. The good news, however, is that he still managed to steal 17 bases in 115 games. Even better, he stole 10 of them in 41 games with the Astros, as opposed to stealing 7 bases in 74 games with the Brewers. He also got caught 6 times with Milwaukee (when he was mostly hurt), and he only got caught 3 times in the last 41 games in Houston. 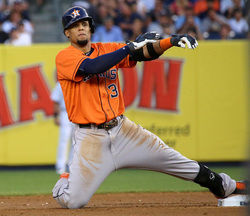 Due to injuries, Carlos Gomez's 2015 was a (relative) disappointment. If he's healthy in 2016, expect a big year - quite possibly 25+ HR and 25+ SB. *10 stolen bases toward the end of the season with the Astros indicates that, when he got healthy again, his speed was still a factor. Expect 20+ (maybe 30+) stolen bases again if he stays healthy. *Consistent power from '12-'14 paired with injuries in '15 indicate that the power is no fluke. Again, health is the issue. If healthy, Gomez will hit 20+ HR, no problem, especially with a better lineup around him. *Age 30 is right at that threshold for a power-and-speed player where he, maybe, starts to think about stealing less. We don't think Gomez is there, yet, unless he has another season full of leg injuries. If his legs are hurting this season, expect a permanent decline in steals. In his injury-plagued 2015 season mixed between the Brewers and the Astros, he hit 12 HR with 17 SB. Averaging out his disappointing 2015 campaign and it projects out to about 16 HR and 23 SB. And if he had been healthy for those 115 games and/or hit for a decent average (his career average is .260, and his average from ’12-’14 was .277), we think he had a good shot at a 30/30 season, or at least a 25/25 season. Expect a solid year out of Carlos Gomez, and also expect him to see some DH time if necessary, much to the chagrin of Evan Gattis owners. Also… keep an eye on whether he or George Springer ends up hitting in the cleanup spot behind Carlos Correa. If Gomez hits cleanup, he may drop down to 15 steals. Then again, the big bats after the cleanup spot in Houston are also big strikeout bats, so Gomez may still get a lot of steal signs to get into scoring position however he can. Look for Gomez to go 25 HR and 20 SB with a .265 batting average. He should also score 85+ runs and drive in just as many RBI.